Harriet Chapel is located in the Catoctin Furnace, three miles south of Thurmont. The furnace, originally known as Johnson Furnace, began iron-making operations in 1776. As the furnace operations grew, so did the population around it, and in 1827 it was decided a church should be constructed. The construction was completed in 1828, and worship services were led by a Moravian minister from Graceham. On October 25, 1833, Harriet Chapel was consecrated by the Episcopal Bishop of Maryland and became a mission church of All Saints’ Episcopal Church located in Frederick, MD. 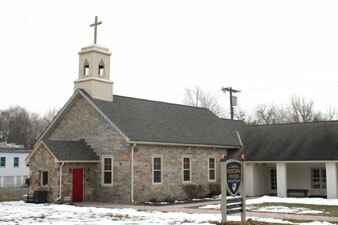 Harriet Chapel remained a mission church until 1921, when Harriet Chapel became its own parish – Catoctin Episcopal Parish. Harriet Chapel is named after Harriet McPherson Brien, who was the wife of the owner of the furnace, John Brien, when the church was constructed. John Brien deeded the land to build an Episcopal Church at Catoctin because his wife found it very difficult to regularly attend her own church, All Saints’ Episcopal Church, some twenty-four mile round-trip in Frederick. Harriet died in April 1827, prior to the construction of the Episcopal Church at Catoctin being completed. Today, Harriet Chapel continues to strive and serve its members and its community.